We’ve been regulars at Loch Fyne Seafood & Grill in Norwich for over 5 years, often going to the new menu previews, specials such as Burns night and wine tastings, and several birthdays. Many of the excellent staff there including Pedro and Sophie have been consistently courteous, humorous, friendly, and great advisers on specials and new dishes. 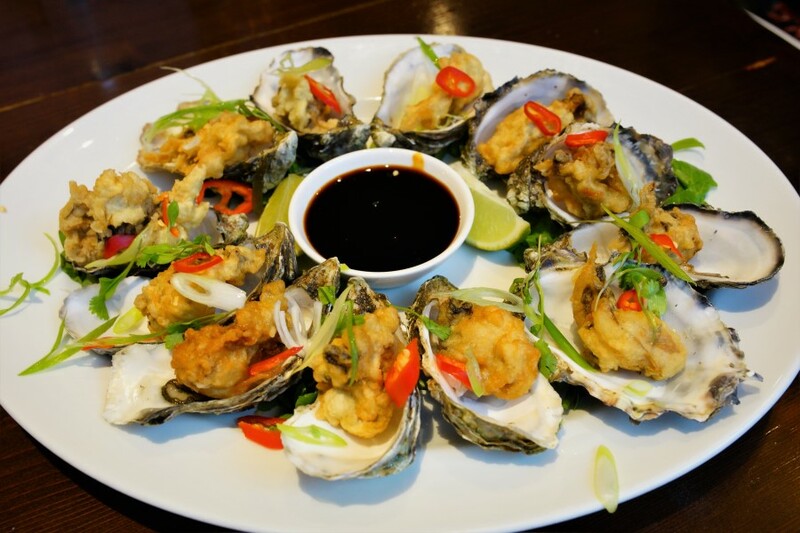 For instance, neither of us ate oysters until we tried their Tempura ones (sorely missed from the menu) and we even now dabble with the raw ones with Tequila and Lime, best chewed not swallowed. 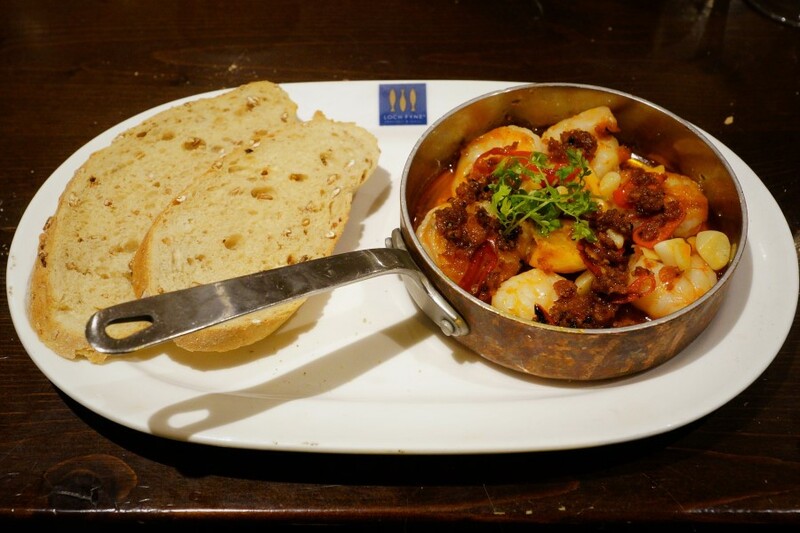 Again, on recommendation, we tried the new-for-2017/18 divine and warming Fisherman’s Stew with a variety of fish and seafood in it (tuned to your preferences upon request, I added Chorizo and skipped the Squid). I once hate(d) fish, Loch Fyne and Pedro have changed that. Whether it’s the mixed creamy mash Fish Pie, Fisherman’s Stew, Grilled Cod Rarebit, Monkfish, Salmon or the King Prawn Malabar Curry – I can honestly say I eat fish now! 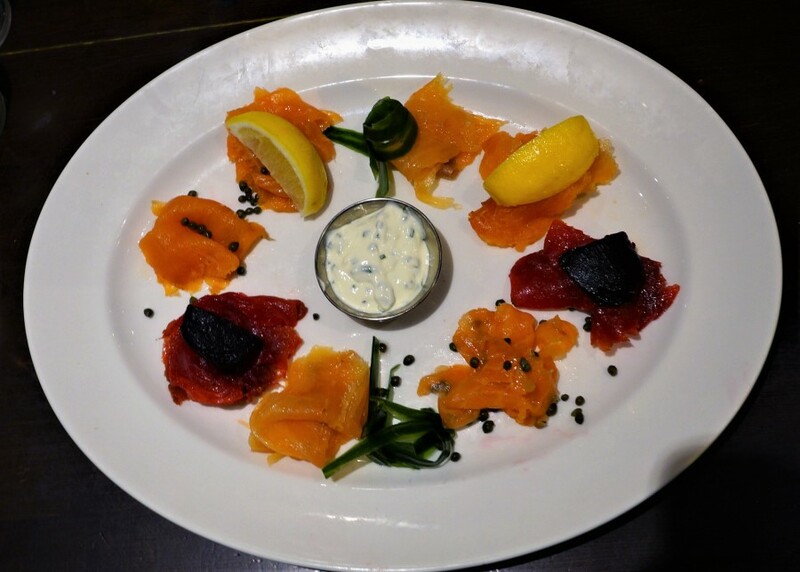 The Salmon four-ways is of course divine, with Classic, Gin-cured, Beetroot-cured, Bradan Orach (“Golden Salmon” in Gaelic) which is dry cured in sea salt then cold smoked for 24 hours using wood shavings from retired whisky casks, giving a fully flavoured smoke with rich flavour in traditional Highland style. I do miss the table theatre when the salmon used to arrive with an upturned smoky whisky glass over it. 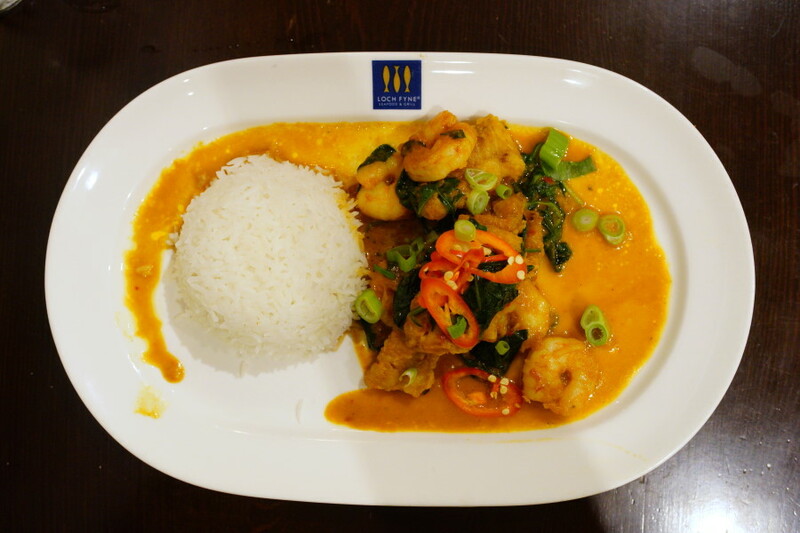 The Bird’s eye chilli-hot King Prawn Malabar Curry also comes with the softest flesh Pollock that falls apart in your mouth and creamily balances out the gentle crunch of the Prawns and the substantial heat of the chillies. The combo works perfectly though and I’ve never found it too hot or overpowering of the fish. You can, of course, leave the chilli slices to one side if they are too much for you. Prawns also appear in the Pan-fried chilli & garlic king prawns with lemon in olive oil, and parsley garnish. This is a dish that has locally improved over the years and comes with copious garlic chunks and slices, and a thicker sauce that screams to be mopped up by the malted bread. These taste best when the prawns remain dusted with the smoked Paprika and quite copious amounts of the dried pepper spice are cooked but not burnt in with the oil, even clumping into the sauce, augmenting the smoky and spicy flavour. The Grilled Cod Rarebit looks like a disassembled shepherd’s pie from a distance until you realise the mince is Le Puy lentils and the mash is cheesy cod! 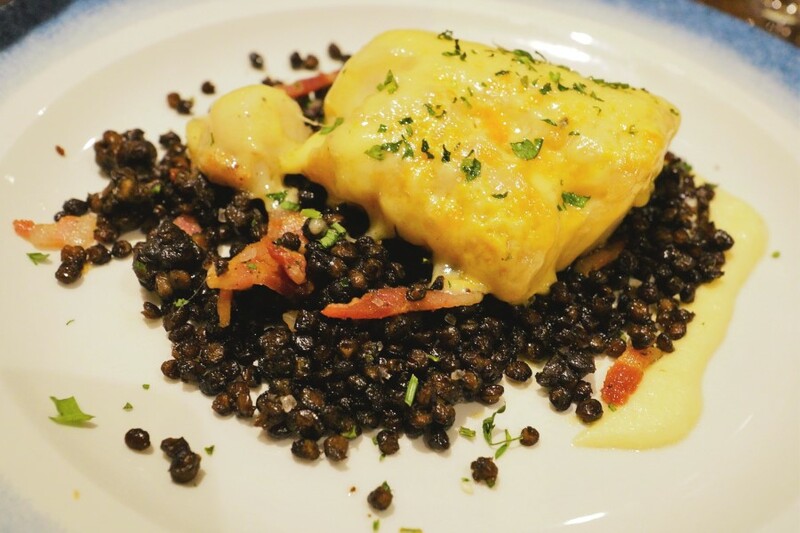 But this cheeky dish combines a bed of cauliflower purée, Puy lentils, and bacon vinaigrette, with a glorious topping of cheese and mustard cod. The creamy cod is draped in melted cheese and lightly brushed with mustard (the first time I had this the mustard was overpowering but it’s now more subtle) it’s set off perfectly by the peppery earthiness of the Puy lentils and salty bacon slithers. Not on the regular menu but a rare treat is the occasional Monkfish special. Recently we had it wrapped in ham/bacon, with Mussels and cream on a bed of Dauphinoise potatoes. Monkfish is great for people that don’t like fish! Once described as poor man’s lobster, it has the texture and even taste of a large Crustacean lobster/giant prawn meat – in fact, it could be described as meat not fish, like the tenderest of moist chicken flesh. The fish on the plate looks nothing like the somewhat scary Lophius in the wild – which maybe becoming unsustainable, so responsible fishing is required to preserve the numbers of this delicious creature. Many years ago, Loch Fyne did a deliciously divine Monkfish and Chorizo Risotto. Fish isn’t to everyone’s taste, though good fresh fish can taste somewhat meaty. Ask the waiter which fish is most meaty if you want to try. If a fish smells fishy it’s probably not fresh! Similarly, the best salmon has the least smell bringing out instead the flavours of the curing. 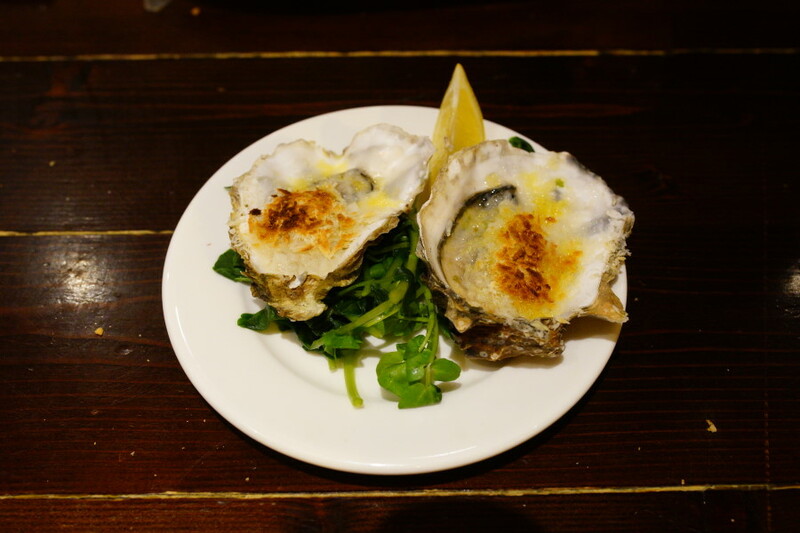 Loch Fyne offers food from the land as well as the sea, including Aberdeen Angus burgers and 28-day Rib Eye Steak. The random timing of the eggs arriving with my Flaked British Ham Salad has been more amusing than annoying, particularly when it was first on the menu. Given that I’m not mad keen on eggs, that’s not a biggie! It’s become a game there now to get that dish perfect for me, runny yokes, warm heritage spuds, the right (in my case extra mustard) amount of dressing, crisp lettuce leaves. That much I’ve always felt there and why we keep going back, at least once a month and sometimes for breakfast at a weekend! Only once did we ever have a poor service night – the place was beyond packed and any dishes that were inconsistent were always replaced or compensated. Having eaten probably 300 dishes there over the years, complaining about or sending back just 3 means we can honestly say that on a long-term review they are 99% great! If you’ve ever been there just the once, and had a poor experience, say something to them, and try them again. Tell Pedro, Laslo or Kevin that “Katy sent you”! Access: A wide doorway, pavement level, disabled parking on the street, and a disabled access toilet.